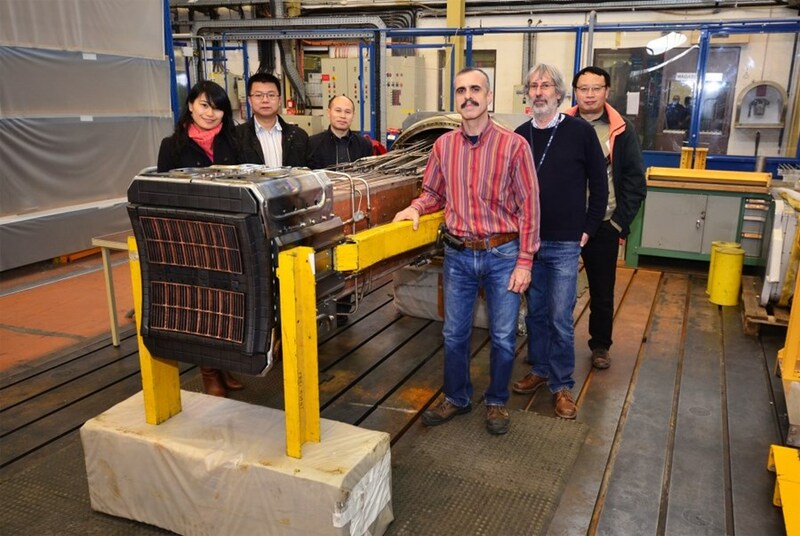 As IRFM's Roland Magne and Serge Poli were preparting the C2 antenna for its long voyage to China, ITER's Caiping Zhou, Xiaoyu Wang and Feng Liu, and CEA's Xiao Lan Zhou (all originally from SWIP) came to bid farewell. Surprisingly, some twenty years of sporadic exposure to a temperature of 60 million degrees have left little trace on the C2 antenna's "mouth"—except for a bit of superficial melting here and some black deposits there, Tore Supra's lower hybrid antenna looks almost as new as the day it was installed. One of the two original lower hybrid antennas of the CEA-Euratom tokamak, C2 greatly contributed to the progress of current drive analysis. It also played a key part in the success of the machine. "It is the hybrid system that allows for long pulses," explains Roland Magne, head of the Radio Frequency Heating and Current Drive group at CEA's Research Institute on Magnetic Fusion (IRFM). Tore Supra entered operations in 1988 at CEA-Cadarache and still holds the world record of discharge duration with a six-and-a-half-minute pulse achieved in 2003. "C2 is still in good condition and can be advantageously re-used for current drive experiments on another machine," adds Magne. Recycling has always been part of fusion history: last week, the C2 was being prepared for a long trip to China. The antenna will soon be fitted onto the Chinese tokamak HL-2M, currently under construction at the Center for Fusion Science of China's Southwestern Institute of Physics (SWIP) in Chengdu. C2 will not travel alone. Tore Supra is also shipping the 8 3.7 GHz, 500 kW klystrons that used to feed the antenna. Although they also operated for more than 20 years, the C2 klystrons (electron tubes that generate and/or amplify the radio-frequency waves) are still in operating condition. The antenna and the klystrons will set the stage for a collaborative physics experiment between IRFM and SWIP. 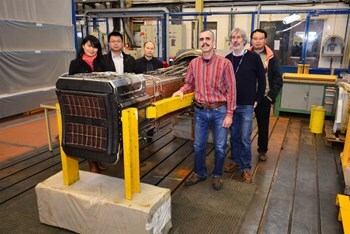 As a first step, four of the klystrons will be coupled to an antenna that the Chinese are designing for the existing tokamak HL-2A for experiments due to begin in 2014. (HL-2A is the original ASDEX Tokamak that was transferred from IPP Garching to China in 1995, and entered operations at SWIP in 2002.) When HL-2M is operational in 2015, all eight klystrons will be connected to the C2 antenna. "This collaboration will provide for some very important ITER-relevant physics program," adds Magne. On Tuesday, as the C2 antenna was about to be packed in its wooden crate, Chinese staff from CEA and ITER, all originally from SWIP, came to bid farewell. By 2015, both the antenna and the klystrons will start a new life in a brand-new tokamak on the other side of the world.